I’ve had two scheduled c-section births and both were very different in terms of the way I felt about them. Although the actual operation was the same, looking back one was better because it focused more on the baby bonding side of things. 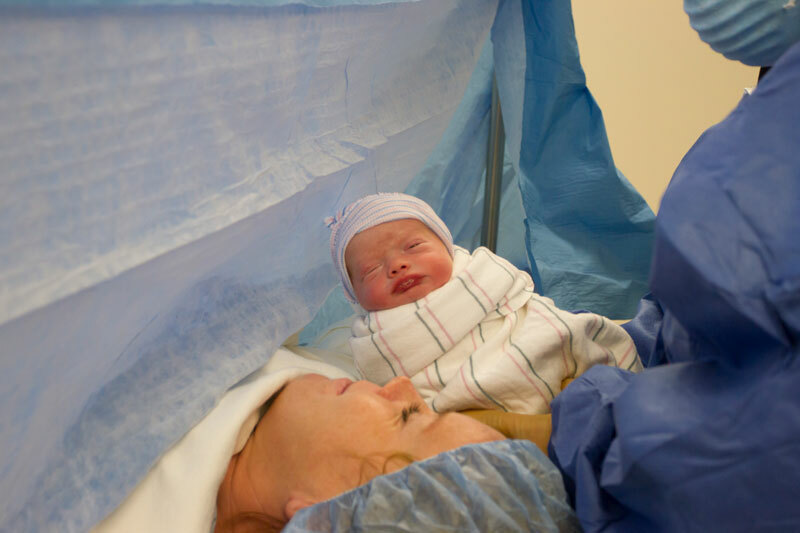 Here’s what I learned from the experiences and how I think you can plan for a great c-section birth – if you already know this will be on the cards for you and your baby. While this may not be possible for medical reasons, if the hospital can accommodate your request, I wholeheartedly recommend your new baby comes with you to the recovery room after surgery. I was separated from my first son after his birth, due to a midwife being unavailable at the time to look after us both, and I still feel upset about this. My baby was born at 8.30am in the morning but didn’t breastfeed until late that night. He was tired and possibly drugged out and as such, we didn’t bond through breastfeeding until much later. I know this isn’t everyone’s experience, but my husband was asked to wait outside while I was given my epidural for one of my births. I was scared about the upcoming surgery, feeling alone and just wanted him with me the whole time. I’m sure if I’d just asked for him, it would have been fine to have him stay with me. But I didn’t. I didn’t speak up. I also didn’t request enough pain relief in the days after the first surgery. The second time around though, I knew from experience the best way to manage pain is to ensure the drugs aren’t given a chance to wear off. The message is speak up. Always speak up! I’ve had lots of surgeries in my time and I’ve learned to always ask for anti-nausea medicine whenever I’m given anaesthetic. You may have a stronger stomach than me, but know this is available to you if you need it. Requesting it before your epidural may make you more comfortable, and avoid making a big mess. While an epidural spinal block is absolutely necessary during major abdominal surgery, I was also given morphine after my first son’s birth and felt very groggy. I wish I’d talked to my anaesthetist about this beforehand. I’m not sure if I was given such a strong drug after my second son was born but I suspect not as I felt very present after his birth. I’m not saying resist the drugs (you will need them and you’ll be thankful for them! ), just that it’s a good idea to chat to your anaesthetist first about how they may effect you and what can be done to ensure you aren’t in pain but still alert and able to enjoy the experience. While a c-section is a medical procedure and you and your baby’s safety comes first, do talk to your doctor about anything you’d like to happen. I was able to request delayed cord clamping – by only 30 seconds as my doctor said she didn’t want to expose my open wound any longer than this – but had I not asked, it would have been done straight away and my baby would have missed out on receiving that wonderful iron-rich placental blood. Maybe you want some calming music played during your procedure or a doula (birth coach) present? Whatever it is, you can own your c-section birth and have a plan, but you’ll also need to be respectful that it’s still a surgery. Yes, you’ve been given a date and time to arrive at the hospital but this doesn’t mean things will run by the clock. Emergency births trump planned c-sections (as they should) and as such, you and your partner might be waiting a while. Plan for this and pack some magazines and other entertainment. You’ll be fasting since the night before, so if you can, it’s best to get a morning slot, if you are offered one. Being hungry and nervous about your upcoming surgery at the same time is no fun. A c-section is major abdominal surgery so you will be in hospital longer than a natural birth. You will also experience pain and even getting up to brush your teeth will be difficult. Rather than calling a nurse every time you need to get out of bed, pack a few toiletries that you can easily grab from your bedside drawer – moisturiser, face wipes, toothbrush and paste (rinse with a cup of water on your tray).